NB : See also various singles and albums with Mavis Staples, Pop Staples, Roebuck "Pops" Staples. The Staples story goes all the way back to Winona, MS, in 1915. It was then and there that patriarch Roebuck Staples entered the world. A contemporary and familiar of Charley Patton, Roebuck quickly became adept as a solo blues guitarist, entertaining at local dances and picnics. Gradually drawn to the church, by 1937 he was singing and playing guitar with a spiritual group based out of Drew, MS., the Golden Trumpets. Moving to Chicago four years later, he continued playing gospel music with the Windy City's Trumpet Jubilees. 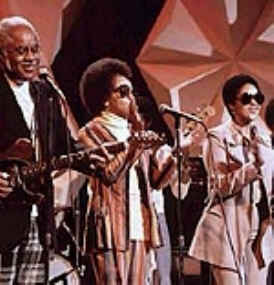 A decade later Pops Staples (as he had become known) presented two of his daughters, Cleotha and Mavis, and his one son, Pervis, in front of a church audience, and the Staple Singers were born. The Staples recorded in an older, slightly archaic, deeply Southern spiritual style first for United and then for Vee-Jay. 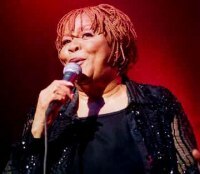 Pops and Mavis Staples shared lead vocal chores, with most records underpinned by Pops's heavily reverbed Mississippi cottonpatch guitar. In 1960 the Staples signed with Riverside, a label that specialized in jazz and folk. With Riverside and later Epic, the Staples attempted to move into the then-burgeoning White folk boom. Two Epic releases, "Why (Am I Treated So Bad)" and a cover of Stephen Stills's "For What It's Worth," briefly graced the pop charts in 1967. In 1968 the Staples signed with Memphis-based Stax. The first two albums, Soul Folk in Action and We'll Get Over, were produced by Steve Cropper and backed by Booker T and the MG's. The Staples were now singing entirely contemporary "message" songs such as "Long Walk to D.C." and "When Will We Be Paid." In 1970 Pervis Staples left, and was replaced by sister Yvonne Staples. Even more significantly, Al Bell took over production chores. Bell took them down the road to Muscle Shoals, and things got decidedly funky. Starting with "Heavy Makes You Happy (Sha-Na-Boom Boom)" and "I'll Take You There," the Staples counted 12 chart hits at Stax. When Stax encountered financial problems, Curtis Mayfield signed the Staples to his Curtom label and produced a number one hit in "Let's Do It Again." The Staples went on to continued chart success, albeit less spectacularly, with Warner, through 1979. One more album followed on 20th Century-Fox in 1981. After a three-year hiatus, they signed a two-album deal with Private I and hit the R&B charts five more times, once with an unlikely cover of Talking Heads' "Slippery People." 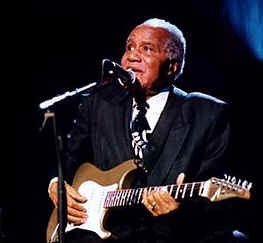 The Staple Singers found a new audience in 1994 when they teamed with Marty Stuart to perform "The Weight" on the Rhythm, Country and Blues LP for MCA.